Trained as a pilot, then a journalist, Frederick Forsyth turned to fiction and became one of the most lauded thriller writers of our time. 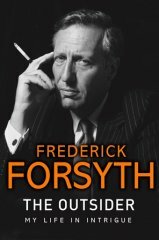 As exciting as his novels, Forsyth’s autobiography is a candid look at an extraordinary life, whose unique experiences have provided rich inspiration for thirteen bestselling thrillers. Former RAF pilot and investigative journalist, Frederick Forsyth defined the modern thriller when he wrote The Day of The Jackal. Since then he has written many novels which have been bestsellers around the world, most recently, The Kill List. He lives in Buckinghamshire, England. Will keep you turning the page. Well! lovely to hear about one of our greatest writers. Well worth waiting for, exciting! Looking forward to reading this book.